The Saint James’s Singers will kick off their 2017 season with one of the most joyous pieces of choral music ever written. 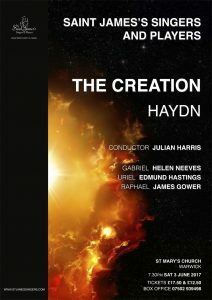 Haydn took text from both the Bible and Milton’s Paradise Lost to compile an oratorio which covers the seven days of the Creation and which is guaranteed to send an audience away enchanted and humming any one of several most appealing melodies. The joy of the piece comes largely from Haydn’s astonishing word painting: the deep darkness of chaos is expressed in a spooky opening section, there is a moment of high drama at the appearance of light and throughout the piece the music paints vivid pictures of lions, great whales, the call of birds and even the slithering of snakes. There are storms, with thunder, lightning hail and snow, and there are moments of great calm depicting the moon and stars or a beautiful pastoral scene. There are huge choruses of praise and wonderful arias including one of the most delightful love songs between Adam and Eve. 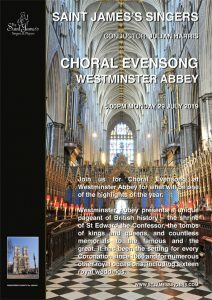 The choir will be joined by three highly regarded soloists – favourite guests of the Saint James’s Singers: Soprano – Helen Neeves, Tenor – Edmund Hastings and Bass – James Gower. 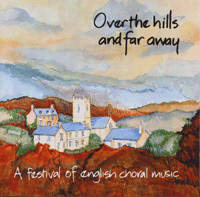 The concert takes place at the Collegiate Church of St Mary in Warwick on Saturday, 3 June, starting at 7.30pm. Tickets are £17.50 and £12.50 or £5 for children under 16 and are available now from the SJS box office on 07502 939498. Could you tell me how I might join your choir please? To join SJS please contact us via the Join Us tab right hand side of the Home Page with phone and email. Box Office mobile number is not working and not enabling me to book Creation tickets despite 3 calls made so far? No call back received either.